United Kingdom Kilts, well what exactly does that term encompass? Probably more than you would at first think, everyone knows that the kilt is worn with great pride in Scotland and to a lesser extent in Ireland. But did you know that it is also worn on the Isle of Man, Wales, Cornwall and Northumberland. There is evidence of the kilt being worn in Cornwall as early as 1510, and Cornish tartans were revived in the 20th Century, the first modern Kilt was black followed by several tartans. These include the, Cornish National Tartan, Cornish Hunting Tartan, Cornish Flag tartan, and the Cornish National Day Tartan. The Northumberland kilt has almost certainly the oldest tartan known, it is believed to date back to Roman times. It is also widely known as shepherd's plaid, and it's black and white check is very distinctive. Below there is a photo of two very different kilts, the one on the left is the Irish County Armagh tartan, and beside it is the Scottish Wallace tartan. The Welsh kilt is gaining huge popularity in Wales, as more and more people are rediscovering their Celtic heritage. There is a big resurgence of Welsh National pride, and the kilt (or cilt in Welsh) is being worn more and more by Welshmen. Recently a range of Welsh tartans have been produced at the Cambrian Woolen Mills. One of the most popular is the St David's tartan and despite a lack of any evidence that the Welsh or any Celtic Nation traditionally used tartan to identify families, more and more family tartans are being produced and registered. Davies,Thomas, Williams and of course Jones are amongst the most common names and the most popular tartans. 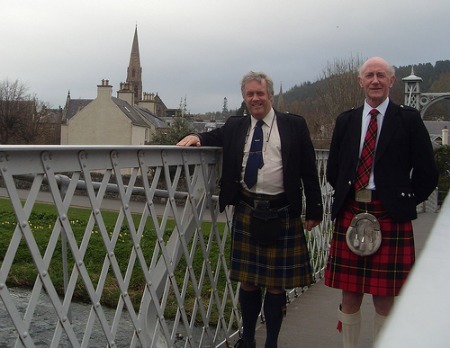 As is common with kilts across the United Kingdom they are mostly seen at formal occasions such as weddings. However there is now a tendency for much less formal wear and they can often be seen at rugby and football matches. According to Welsh Tartan center officials, the Pride of Wales tartan is the most popular. Without any doubt United Kingdom kilts are rapidly gaining in popularity not only in the United Kingdom, but also around the world as more people reclaim their Celtic ancestry and enjoy the sense of occasion when wearing the kilt.